Pastor William L. Cain was blessed to had been born and, reared by God fearing parents Deacon Alonzo Cain, Sr. and Deaconess Marguerite Cain who taught his two brothers and him where to place their values. His parents instilled in them the merits of serving God. His father, being a Deacon in the local church, was the spiritual leader of the household and insured the further communion and admiration of God. Pastor Cain is a native of Baltimore, Maryland, graduated from Sollers Point High School in Baltimore County. He is married to the former Bernice D. Johnson and is the father of one child, Krystal. For past 30 years he has been a Computer Aided Drafting and Design Systems Administrator at the Maryland Department of Transportation, Maryland Port Administration. Pastor Cain studied at the University of Maryland Eastern Shore, Johns Hopkins University and Arlington Bible College, where he initiated his studies of Bible training. He went on to further his Bible training at the Philadelphia Bible College and Seminary, where he earned a Bachelor of Arts Degree in Theology, a Masters in Theology, and a Doctor of Theology Degree. 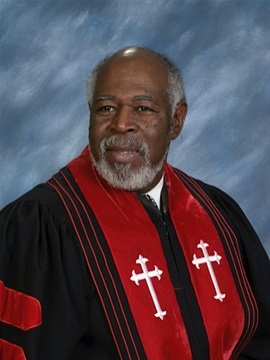 As a son of New Shiloh Baptist Church in Turner Station, Pastor Cain was licensed a Deacon on July 8, 1979, licensed to the Gospel Ministry on June 14, 1981 under the leadership of Rev. Dr. James A. Everett, Sr. and ordained June 30, 1991 under the leadership of Rev. Dr. Alfred C. D. Vaughn. He also served as Interim Pastor at the Baptist Union Church in the state of Virginia. He actively participated in a number of ministries while at New Shiloh until his call to the pastorate. On July 19, 1998, Pastor Cain was installed as Pastor of the Mount Winans First Baptist Church. His spirit-filled, visionary leadership has resulted in the progressive growth and development of the congregation. Under his leadership the church purchased its first computer system, instituted its Wednesday Noon Day Worship Service, established the Life Application Bible Class developed the New Convert’s class, the New Member’s Class, Women’s Ministry, Men’s Ministry, reorganized the Sunday School, established the Department of Christian Education, and published the church’s handbook.The most important thing to him is winning the lost to Jesus Christ. Among his many activities, Pastor Cain has been Profiled and featured in the Maryland Port Administration's Newspaper "Dock Sider". He was a teacher at Philadelphia Bible Institute and College, past president of the Baltimore County And Vicinity Ministerial Alliance, was a member of the Executive Board of Directors for the Mount Winans/Westport Shalom Zone.He also is a member of the Cherry Hill Ministerial Alliance. He established a Pray and Bible Study group at his workplace and participates in the Maryland's Tomorrow Program for Baltimore County Schools. He is a Certified Teacher of Bible College at All Levels by The Accrediting Commission International. Pastor Cain is a Spirit-filled, gifted teacher and preacher totally committed to his calling and ministries. As a result, many hearts have been blessed and many souls have been saved throughout this country.